Move over french fries—there's a new fried friend in town! Whether you use pickle chips or spears, you're gonna love fried pickles! 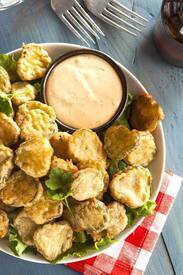 Try this easy Texas Roadhouse CopyCat fried pickle recipe with a dipping sauce made of mayo, horseradish, ketchup, and cajun seasoning. Is your mouth watering yet?